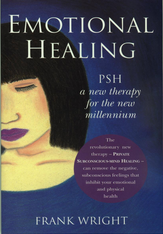 Emotional Healing was written by Frank Wright (the founder of P.S.H. Therapy) in Sydney Australia. It was published in August 1995 and has continued to sell steadily ever since. Now in its second edition, the book has sold over 11,000 copies. Frank died in his sleep on the morning of Sunday 19th July 1997. He was the father of two daughters and a son, and the grandfather of six children. He will be best remembered for his pioneering work in creating, teaching and promoting the P.S.H. Therapy approach. Chapter 1: What is Private Subconscious-Mind Healing (P.S.H.)? Check out your local library – in Australia many have a copy that you can borrow. This book is now available in ebook form. You can purchase it from here.